1. 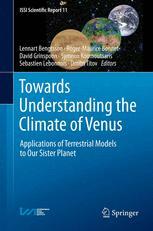 Lebonnois S., Lee C., Yamamoto M., Dawson J., Lewis S., Mendonca J., Read P., Parish H., Schubert G., Bengtsson L., Grinspoon D., Limaye S., Schmit H., Svedhem H., Titov D., ‘A Comparative Analysis of Simplified General Circulation Models of Venus Atmosphere’, ISSI Venus Working Group book, Chapter 4.3, 2011. 6. Montabone L., Mendonca J., Lebonnois S., Wilson C., 'The Sesonality of the Atmospheric Polar Vortices on Venus compared to Earth, Mars, and Titan', 2013, EPSC London, UK. 5. Read P., Chelvaniththilan S., Mendonca J., Lewis S., 'Comparative global energy budgets for Earth, Mars and Venus’, 2013, EPSC London, UK. 4. Mendonca J., Read P., Wilson C., Lee C., 'The New Oxford Planetary Unified Model System for Venus (OPUS-V)', LPI Boulder, Colorado, USA. 3. Lewis S., Dawson J., Read P., Mendonca J., Ruan T., Montabone L., 'Super-Rotating Jets in the Atmospheres of Terrestrial Planets’, 2012, LPI Boulder, Colorado, USA. 2. Read P., Lewis S., Mendonca J., Montabone L., Mulholland D., Ruan T., Wang Y., 'Climate Regimes on Terrestrial Planets Within a Hierarchy of Dynamical Models’, 2012, LPI Boulder, Colorado. 1. Lebonnois S., Lee C., Yamamoto M., Dawson J., Lewis S., Mendonca J., Read P., Parish H., 'Weakly forced atmospheric GCMs : lessons from model comparisons’, 2011, EPSC-DPS Nantes.